The holiday season: Depending on whom you ask, it’s the most wonderful time of the year. 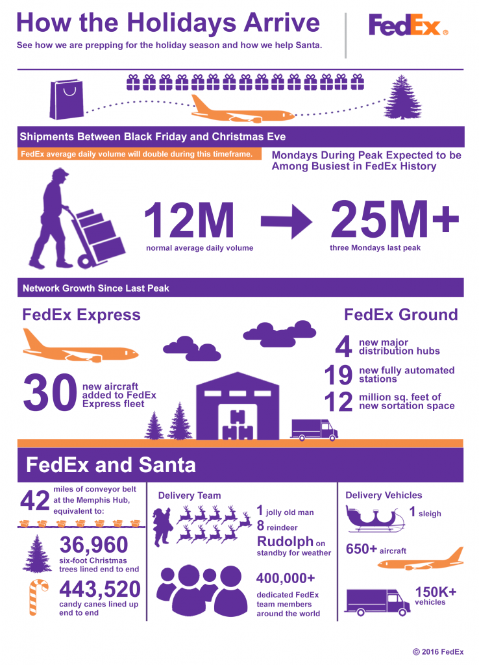 It’s also the busiest shipping season of the year. In fact, the U.S. Postal Service (USPS) expects to handle approximately 750 million packages during the 2016 holiday season, an increase of more than 12 percent over 2015 and double the volume of packages handled just four years ago, according to a press release. Not to be outdone, UPS is forecasting a 14 percent increase in packages shipments, while FedEx is anticipating record peak volume to jump by 10 percent compared to 2015 numbers. Whether you’re mailing gifts of appreciation to loyal clients or cards to industry peers, there are several important dates you need to know, or you may be out of luck—and extra cash due to expedited delivery service fees*. * For FedEx, a $16 Saturday delivery fee will apply per package for anything that will be delivered on Dec. 24 for the following services: FedEx First Overnight, FedEx Priority Overnight and FedEx 2Day.